The images above show fireblight damage. See the dark, dead branches. Description: Fireblight is a bacteria that is primarily spread at blooming time as insects, bees, and the wind infect a tree at the blossom. The tree may not show signs of disease for up to six weeks after becoming infected. It is common during some years, and then you may go for 10 years and not see it again. 1. If a limb like the one above has already been infected, you must prune out the affected limbs. Cut back into the tree 3 to 6 inches into GOOD wood that does not seem to have been infected. Burn or destroy the dead branches by sending them off to your landfill. Do NOT simply discard them by tossing them into a ditch or area near your house. The tossed pieces can reinfect other trees later. Also, put rubbing alcohol onto your pruners between cuts and especially after you are through . 2. You can let the fireblight "run its course" and it should stop spreading. Then, cut it out later this summer when it the wood is dry and brittle or wait until next winter. I usually wait until winter. Burn the infected wood. Take option #1 is the tree is very small and the infection appears aggressive. 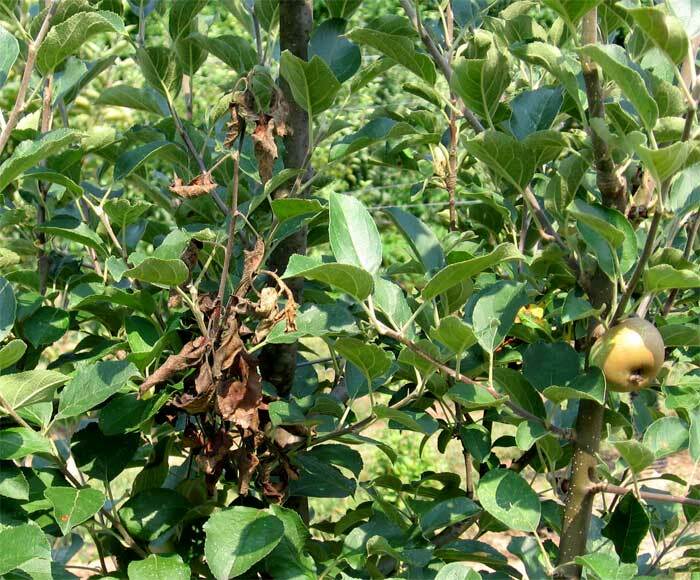 This may seem horrible at the time, but your trees will most likely grow out of this problem. There is little rhyme or reason as to why it appears some years and does not appear others. 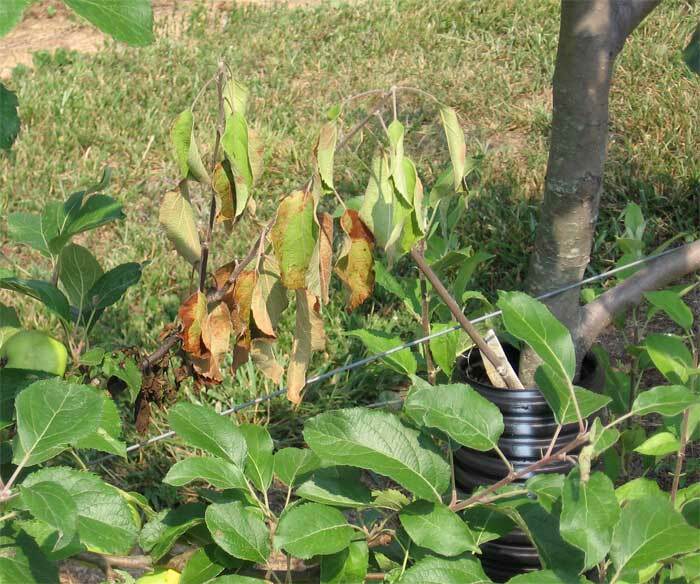 To prevent Fireblight: Make sure that all infected wood is pruned out and discarded as described above before blooming begins. Then, you may choose to spray Agrimycin when the trees are blooming to prevent fireblight, but it is not a 100% effective. Do not add insecticides to the spray as you can kill insects that are pollinating the trees. You would need to spray about once every 5 days while blooming. Once again, it is not 100% effective, but it helps. Seek help from your local agricultural extension agent for more detailed information. Below: Fireblight in the early stages. These leaves turned as brown as the leaves in the images above in about 3 days. 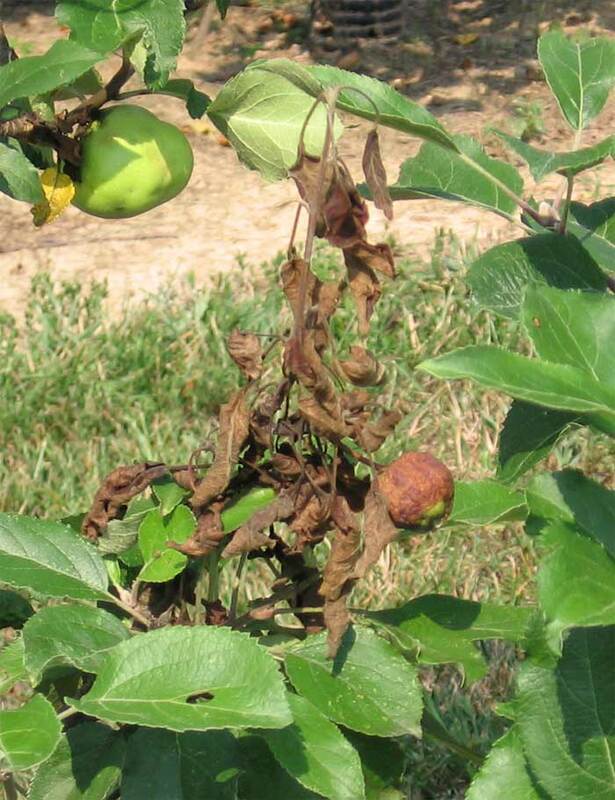 Fireblight kills rapidly.